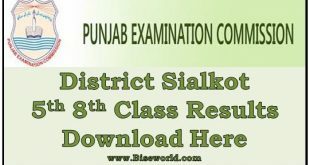 Punjab Examination Commission (PEC) has Announced The 5th Grade Examination 2014 Result Of All Districts Today On 31st March, 2014 . You can check online result on pec.edu.pk. All students of 5th call Grade-5 can check result below. Just select you distrct and tehsil. And enter you Roll Number to get your PEC 5th Class Results 2014 online.